The "new" minimum wage (1,800 bsS) is another mockery and deceit for Venezuelans. If before the hyperinflation was the product of the "economic war" as part of the speech which the Government justified the daily price increases, now that we know the list of "agreed prices", it is almost certain that Maduro and his panegyrics will end by saying, who were "infiltrators" of the Today Dollar portal, those responsible for having published such lists against the "people"
Indeed, in view of this reality, it is proven that such an invention of the "economic war" was no more than an excuse for a rumplón government, inept and incapable to solve the economic problems of the country, or on the contrary, a premeditated policy with the purpose of to sink the people in ill-fated social levels, being these aberrant actions the most convincing when we see that hyperinflation is now driven by the government. In fact, the government at the time of announcing its measures recognized the exchange rate they called "criminal dollar", and just after having spent about two weeks, we see that this referent has doubled in the parallel market. 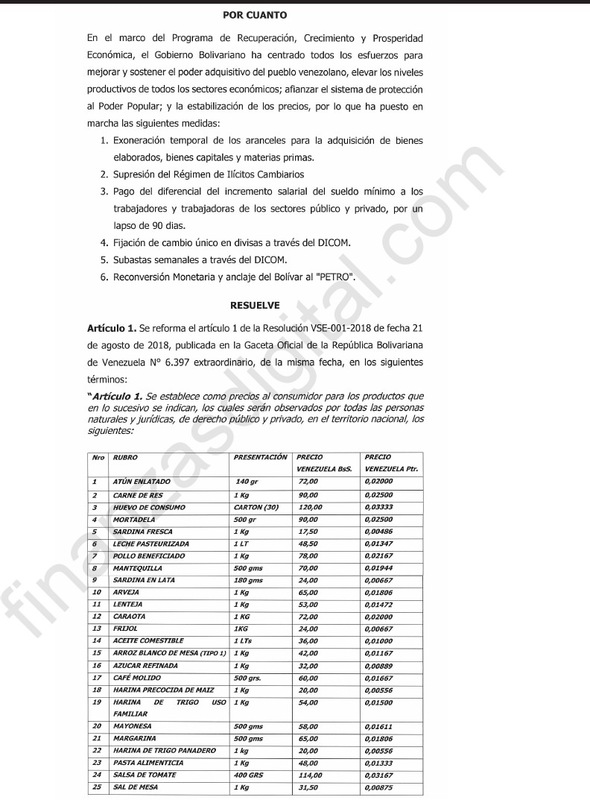 So when you see the values ​​in "sovereign" bolivars published in Official Gazette - No. 6,401 - in relation to cleaning products and personal hygiene we have: Bs. 24 for a toilet soap (80 grams), Bs 150 for a deodorant (90 grams), Bs. 51 Toothpaste (50 milliliters): Bs. 91 toilet paper (4 rolls), Bs. 50 sanitary napkins (8 units), Bs. 48 chlorine (1 liter), Bs. 360 detergent powder (1 kilo) and Bs. 145 a panela soap (250 grams), which are prices that also show the hyperinflationary reality that Venezuelans suffer, and that the monetary costs of these products, not including those that have had in recent days food, and payments we must make for the terrible services we receive such as water, gas, electricity and public transport - which by the way was also agreed in its minimum rate in Bs. 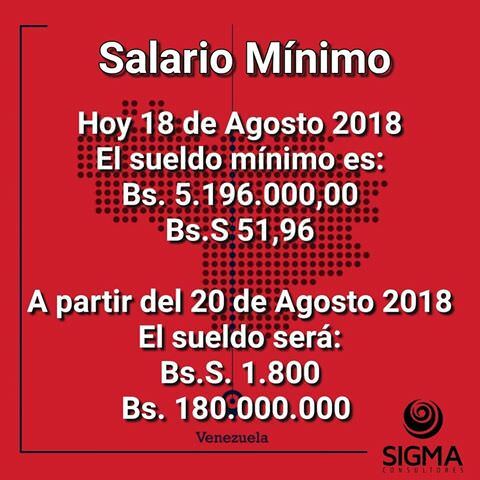 1 "sovereign" - have left the vaunted increase in the minimum wage dead up to Bs 1,800 - 180 million of the murdered bolivares "fuertes" - which will come into force this September. The "agreed" prices for cleaning and personal hygiene products, if we put them in the context of a family like mine with four members, and we assume that all those members will barely consume one of those products - including deodorant - would total an amount of Bs. 919. That is, more than 50% of the minimum monthly salary, and more than 100% of a fortnight for most of the workers we would spend on the mentioned articles, without there being other essential products for the hygiene of the people like shampoo, mouthwash, razors or talcum powder.
. What's more, with the new "monetary" cone, it has not been able to stop the huge queues in banks, as well as the scarcity and commercialization of the minimum amounts that appear in cash. From my point of view, the economic measures of the GOVERNMENT are worse than any set of plans promoted by the International Monetary Fund, the World Bank or any multilateral organization, because they only seek the destruction of the people for them to perpetuate themselves in power, and ensure that the The majority of the population that opposes them continues to emigrate from Venezuela, in order to finally dominate those who have been subjugated by the human aberration of the so-called "card of the fatherland".